Physicists of Julius-Maximilians-Universität Würzburg (JMU) in Bavaria, Germany, with colleagues from the Technion in Haifa, Israel, and Nanyang Technological University in Singapore have reported their discovery in the journal Nature. 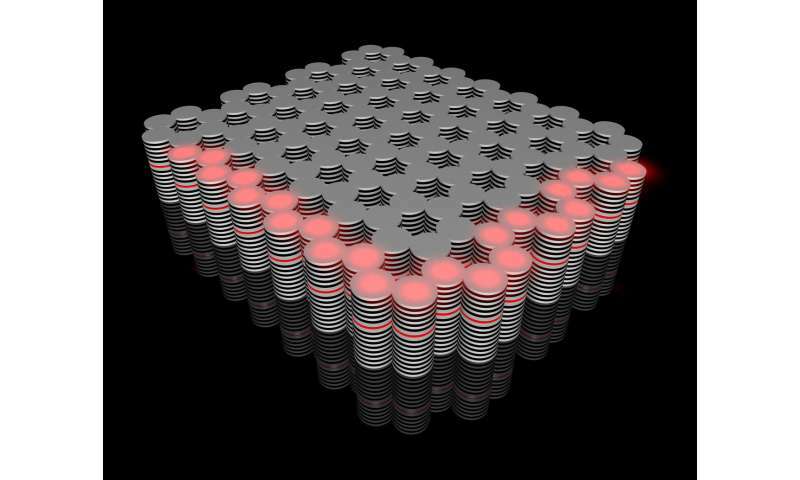 The team has built the first "exciton-polariton topological insulator," a topological insulator operating with both light and electronic excitations simultaneously. Professor Sven Höfling, who heads the JMU Chair for Applied Physics, says such topological insulators have a dual benefit: "They could be used for both switched electronic systems and laser applications." The topological insulators developed previously are based on either electrons or photons alone. Dr. Sebastian Klembt, group leader at Höfling's chair, played a lead role in the project. He gives more details: "The novel topological insulator was built on a microchip and basically consists of the gallium arsenide semiconductor compound. It has a honeycomb structure and is made up of many small pillars, each two micrometres (two millionths of a metre) in diameter." It is a sophisticated system that works in application-oriented dimensions on a microchip and in which light can be controlled. Usually, this is difficult to accomplish: Pure light particles have no electric charge and therefore cannot be readily controlled with electric or magnetic fields. The new topological insulator is capable of doing this by "sending light around the corner," in a manner of speaking.